Apple has won a bittersweet victory in its tablet war with Samsung. A German court has ruled an existing sales ban on Samsung’s smaller Galaxy Tab 7.7 in the country should be extended to all the 27 member states of the European Union, and that the tablet’s design infringes on Apple patents dating back to 2004. 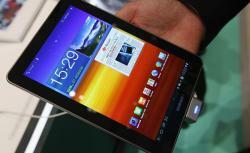 The court however ruled that Samsung’s larger Galaxy Tab 10.1 has made sufficient design changes from its predecessor, and is no longer an iPad rip-off, deciding an injunction on its sale should be lifted. This news comes a week after a U.K. judge said consumers would never confuse a Galaxy Tab for an iPad because they were “not as cool.” Ouch. Samsung isn’t happy, and now has to figure out a strategy to fight back in the court of law and apparently the court of consumer public opinion. A Samsung Galaxy Tab 7.7 tablet, sales of which a German court ruled this week should be banned across the European Union for similarities to Apple’s iPad.